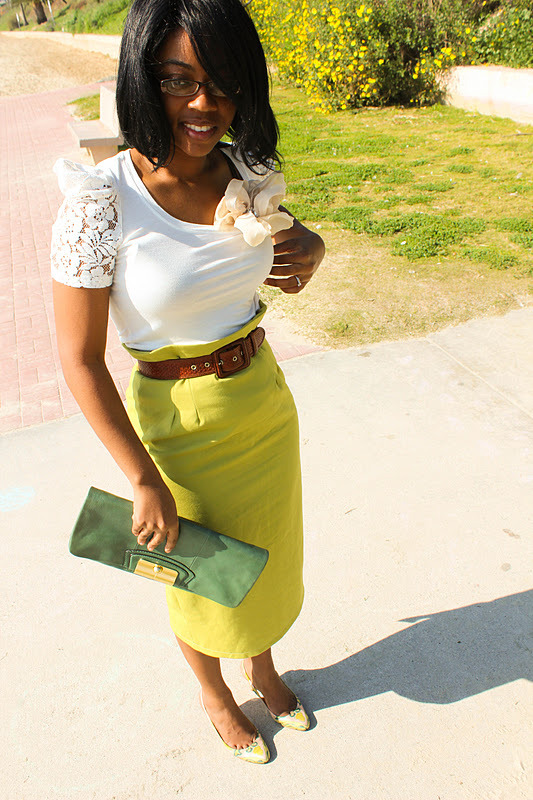 My latest creation is a basic pencil skirt with a little twist. 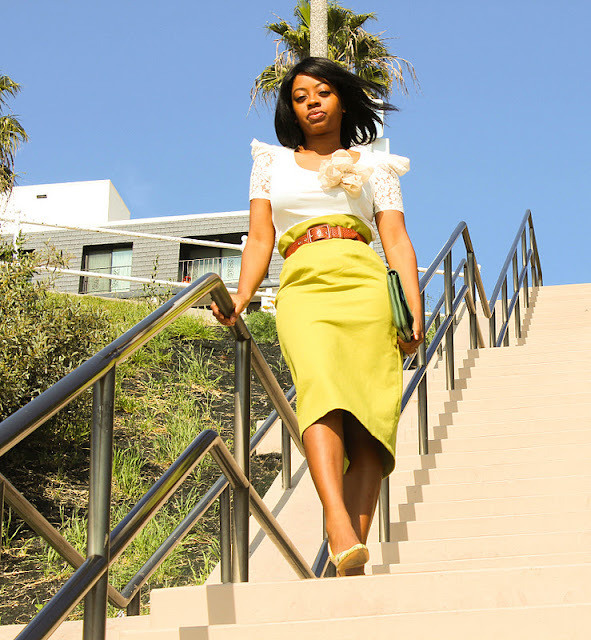 I had this Chartreuse colored fabric that I thought would look great as a pencil skirt. But this time I wanted to jazz it up a bit. I turned what was going to be the inner lining at the waist of the skirt into a little ruffle tab instead. Doing so added a little more interest and femininity to an otherwise simple yet classic silhouette. I'd say it worked out pretty nice. super cute skirt!!!! it looks so cute on you! amazing outfit! and gorgeous photos! you did a great job on the skirt! love it! works great with the top and shoes. PS: what a lovely weather there, when I look outside is't all white... it's SNOWING here! Ooh la la----that skirt! Ça c'est vraiment chic! You made a good choice pairing the skirt with fun accessories. I'll echo Hennie's comment about the weather: it's lovely indeed. Perfect weather to showcase a fantastique outfit. My favorite pics of this set---the last and the first. I love this skirt!!!! Amazing job missy! We have the exact same shirt - great minds I tell ya! this is beautiful! you have such talent. Nice photos and really cool outfit, you look great, I like your skirt, what a great color and that top is so nice, the perfect touch to the outfit also you are really beautiful and your clutch rocks! You have an awesome blog by the way and I am a new follower on GFC and Bloglovin! Hope you will like my blog and follow back! Thanks Sara for taking the time to leave such a lovely comment! So many sweet compliments! I'm excited to have you as a new follower of my blog! LOVE the color and cut of this skirt! Awesome that it's high waist too! So pretty! Love the color of the pencil skirt! SO amazing!!!! You are sooo talented! Thanks a lot for such an amazing compliment! Really excited that you dropped by! Will certainly check out this giveaway! I love your skirt; it's so chic and you styled it so well....when is your clothing line coming out:) i would love to own a skirt like this. Wow! !Tis one is awsum Regina.the lime green and white together look so adorable. Love the color of this skirt! I want to learn to sew!!! Thanks! I have so been into shades of green lately! it might be my new fav color! Also, you should totally learn to sew! I think you'll really love it! Ummmm, I need that skirt!! Gorgeous! I will seriously send you fabric and money. Are you still on FB?